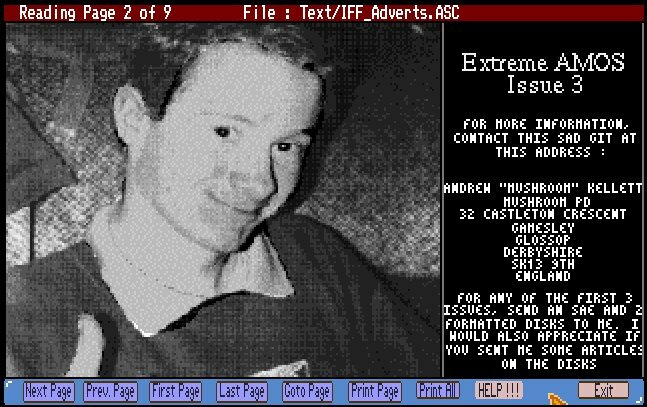 I worked on a lot of projects back in the day on the Amiga, but I think the one I was most proud of was probably Extreme AMOS #3. I started the original Extreme AMOS issues with a friend named Carl Drinkwater, who I had been talking to on the phone and by mail for a while and wanted to work on a similar project. We eventually ended up meeting each other and Carl threw together a very brief version of Issue 1. I didn’t do any coding work on the 1st issue, all I really contributed were a few articles and tutorials. I do remember that the issue was very basic in appearance, the main background was that of a Conan the Barbarian type picture, the music used in the issue was WhiteSong by grubi (of Brainstorm!) (Link To Song On CVGM). There were a few icons for the various bits. I don’t know if I still have the original DMS anymore for the first issue, i’ll have to go and have a look in my Amiga sources and files to see if it’s there. It got a really good recption as it was reviewed in Amiga Computing (November 1995 Issue) and got a very positive review. 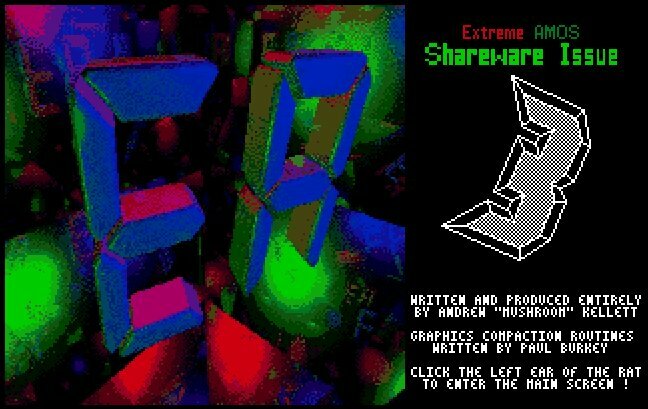 At that point I had already started working on a new engine that could do a lot more with the Amiga. 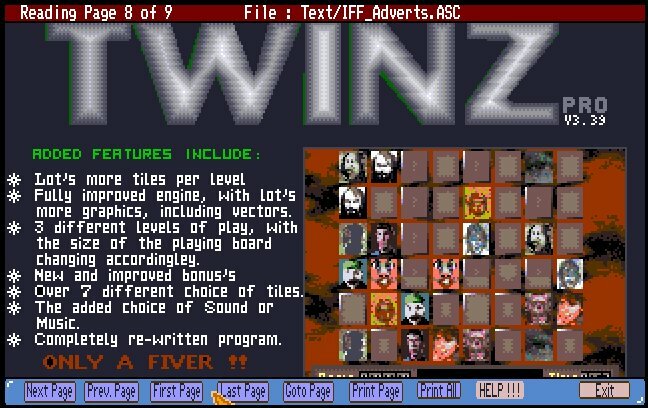 The new 3rd issue came on 2 disks and was laid out very differently, it could put text and graphics in the reader, it used a special scripting language to create articles (so the authors could write them much easier) as well as Squidger, a graphics compression routine by Paul Burkey that ultra compressed the size of the files. I also added a neat system for the programming tutorials that actually showed you what the code did from the tutorial, to help you understand it a little better. These tutorials included stuff like VUMeter demos, some 3d demos and some other routines as well. It took about 6 months of very hard work, but it paid off well and is still looked at today. Another surprising thing with this issue was that it was written using AMOS Classic/AMOS Classic compiler instead of the AMOS Pro compiler. There was a reason that I did this (but I cant remember what, perhaps some compatibility or extra speed (as classic was always faster for some things). Carl had not been in touch during the production of this issue at all, so he had been taken off the team at that point. I have the source code files somewhere on a floppy disk for the magazine and I will release them as soon as I can get them off of the floppies that they are on. I have received lots of requests asking for it. You can also find this on Pouet.net. Obviously for my next Disk Magazine project, there would be a considerable number of changes that I would make to the interface and general operations of the magazine, so I will have to take all of them into consideration. 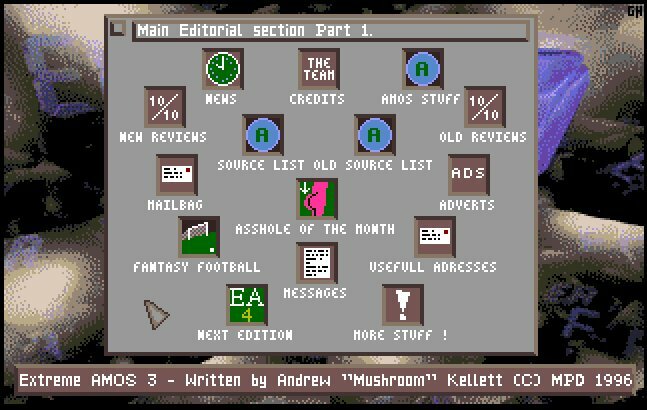 It was nice to see that all the basic operation was still there, that the issue *still* did things that some of the other magazines out there don’t do (Amiga and PC) even today.